Written by Jose Quinonez and Miguel de la Fuente Lau on August 1, 2018 . Ten years ago, we started a movement in San Francisco, leading thousands of low-income and immigrants families throughout the country to become financially visible, active, and successful in the financial system. What started with our flagship Lending Circles program offering zero-interest loans, has evolved into a whole suite of products and services to help people improve their financial lives. We do everything with the steadfast determination to meet people where they are and build on what is good in their lives. We’re now providing financial coaching “windows” at Mexican Consulates in the Bay Area, financing to help cover expensive immigration fees, and innovating tools designed to help clients thrive even more. And all the while, we’re still working with nonprofits to deepen and expand our work throughout the country. 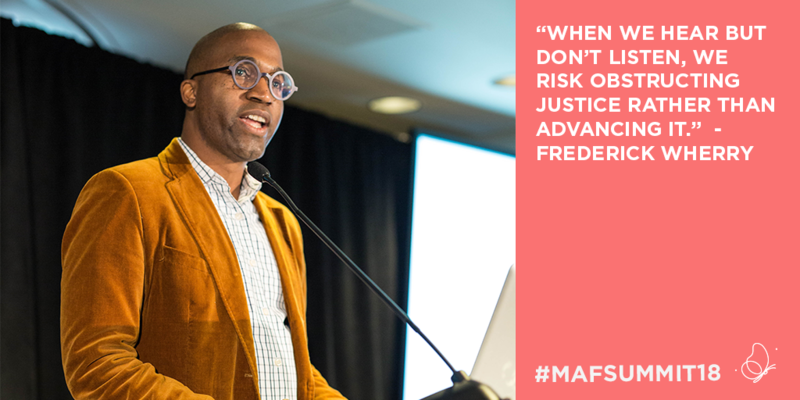 We have a lot to celebrate, but we’re even more energized by what we have coming in November: MAF Summit! We’re hosting this important gathering of partners, colleagues, funders, friends on November 15 and 16 in San Francisco! This year’s theme is “Transcend. Evolve. Take Flight.” We envision ourselves and our communities as a rabble of butterflies, having evolved to withstand adversity, and able to overcome obstacles no matter how big or sudden they seem. We finish the journeys we start and we know the final destination is still ahead. We’re thrilled to bring together an even larger network of change agents—leaders from across the nonprofit, tech, finance, and social sectors—all looking to learn, inspire and build new, long-lasting solutions. We’ll have thought leaders like Fred Wherry from Princeton University and long-time advocates like Daniel Lee from the Levi Strauss Foundation and Elena Chavez Quezada from the Walter & Elise Haas Fund to highlight the good work that’s been done and shift our focus and energy toward building solutions that will endure. We have to be smart and industrious as we leap forward and build solutions to outlast whatever challenges await. By nurturing partnerships, learning from each other, using technology for good, and sharing sacred stories of resolve and resolutions, we’ll come together with purpose and leave prepared for the next 10 years. Join the rabble. Take flight with us.